Once upon a time, Netflix was just a mail order video service, famous for its red envelopes containing DVDs. And when the company went public in 2002, its stock traded for under $9 per share. 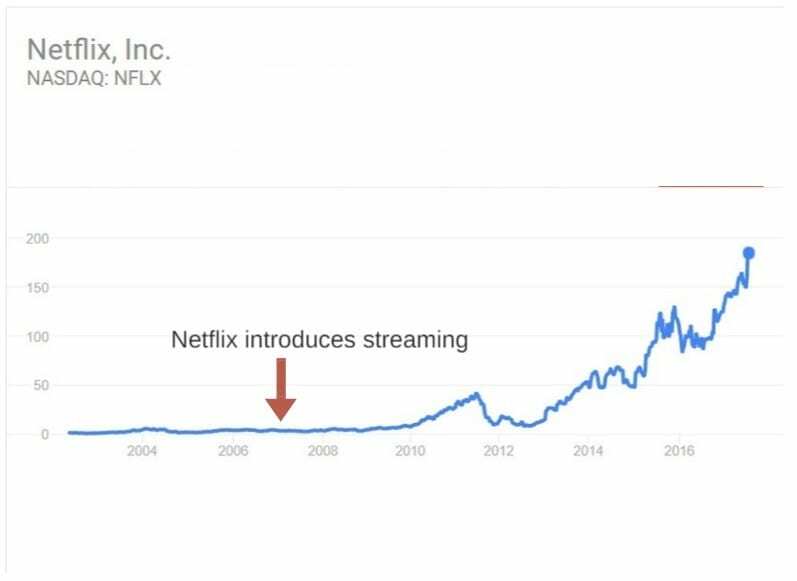 Five years later, the company introduced streaming, forever changed the world of entertainment, and its stock eventually exploded. Like Apple and Microsoft, Netflix’s stock also comes standard with a “what if” question: What if I would have purchased at the IPO? Or even a year or two later? Netflix introduced streaming in January 2007 when its stock was a meager $3.46 per share. Despite analysts being down on the company at the time, Netflix got the last laugh. The company’s stock value has grown 5,110% over the past decade, closing at $180.27 this past Friday, August 4. So, what does that mean for those who invested when the company brought streaming onboard? If you’d invested just $500, your stock would be worth $26,050. If you had $10,000 in the game, your stock would be at $521,000. And if you had $25,000 invested into Netflix, you’d be sitting on $1.3 million today. The stock isn’t slowing down, either. Last month, Netflix exceeded expectations on revenue, subscriber growth and third-quarter guidance, according to U.S. News & World Report. There are now over 100 million Netflix subscribers worldwide, and the service is still growing rapidly. Of course, hindsight is 20/20, and while it’s hard to believe now, Netflix was anything but a sure thing a decade ago. Not everyone was hot on Netflix when it introduced its streaming service. The technology was still new to the general public, despite services like YouTube. At the time, it was unimaginable to stream a program from a box to your big screen. Brian Pitz, an analyst with Bank of America Securities at the time, told the New York Times that Netflix’s earnings were going to be negatively impacted by its decision to focus on delivering programming through the Internet. His recommendation at the time? Sell. Pitz may have had good reason for his recommendation. Netflix only had streaming rights to about 1,000 movies and television shows at the time. At the time, a reviewer for Slate complained that the streaming offerings were “impressively bad” and “nothing I would pay to see.” Today, there are more than 7,000, including several popular original series. Additionally, Netflix’s streaming service only worked on PCs and Internet Explorer at first. Today, you can watch it on just about every device you can imagine. Technology changes fast. Now, we get upset when a video doesn’t load instantly and play in crystal-clear high definition, but in 2007, video streaming at the level Netflix was attempting was in its infancy. So it’s understandable that many were skeptical that a DVD delivery service would be able to pull off launching a successful streaming service. But Netflix proved the doubters wrong and has made a lasting cultural impact in the process. In order for its stock to continue surging, Netflix will need to increase its international subscriber base. Analysts feel the U.S. is well saturated at this point. In an earnings call last month, 1.1 million new users came from the U.S., while 4.1 million were from international markets. The international market still has plenty of room for growth, and the juggernaut that is Netflix is poised to continue its remarkable success story.